I took half an hour out of my day today to meet up with an old friend. She joined the company a year after me, and our paths have been somewhat intertwined over the last fifteen years. She has two kids now, aged 3 and 6, which inevitably changed her perspectives and priorities somewhat, and about eighteen months ago, she put her own career on hold for a while and moved out to Madrid with her husband and his job. It was lovely to see her looking tanned and relaxed and talking about her life living in the same suburb as most of the city’s footballers…. Apparently, if Christiano Ronaldo is sunning himself at the top of Nob Hill, then they live somewhere in the foothills, but it’s still a pretty pleasant place to live. She’s learning Spanish, looking after the kids and wondering if she might retrain to teach English as a foreign language. She looks well and the change clearly suits her. As it happens, her husband has multiple sclerosis too, and we were diagnosed at about the same sort of time and follow the same treatment course (Avonex injections). As is often the case in these sorts of circumstances, we compared notes. He’s doing pretty well, apparently: a few physical problems with his hips and knees which are likely to be indirectly related to his MS, some problems with a rush bladder… but nothing catastrophic. It all sounds very familiar to me, as those are more or less the things that have been bothering me with my own MS over the last year. My friend mentioned too that her husband is almost absurdly positive about his condition, and is very slow to put any of his symptoms down to his MS. It’s a stoicism I can relate to: I know that I probably sound as though I downplay the effect my MS has on my life, but frankly what choice do I have? What’s my other alternative? I can’t deny that I do have plenty of moments when I worry about how I’m feeling: my legs felt particularly wobbly and dead last night before I went out for a run. What did I do? Go to bed and worry from there? No, I went for the bloody run anyway. Not because I'm stoical, but because that feeling isn't going away anytime soon and I really wanted to go for a run. Besides, as my friend reminded me this afternoon when I mentioned that I was starting to forget people’s names, we’re all pushing forty now, and this kind of physical and mental decline isn’t exactly unheard of in people of our age. It was nice to see her. We didn’t only talk about MS either: we also talked about the problems of finding a hairdresser in a country where you don’t really speak the language. Not a problem I have, obviously, but she has thick hair and found herself trying to ask the guy cutting her hair if he had “special scissors”. Is this a specifically middle class-ex-pat problem? It took my wife literally years before she was prepared to get her hair cut in England AT ALL, and she speaks English reasonably well. She always used to go back to France, which seemed a little extreme to me, but I’ve got no hair, so what would I know? I once got a "Half Head" discount on a haircut in New Zealand, but you don't see me flying over there every month to take advantage of that offer, do you? Anyway. Here’s a link to a cool interactive picture on The Healthline. 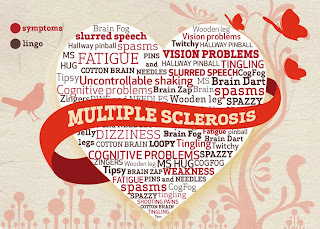 Click through to see the picture in it’s full interactive glory, explaining the most common MS symptoms. Click on the image (or here) to go to the interactive version. Knowledge is power, my friends. Know your enemy. Today? Hallway Pinball and Wooden Legs. MS really is the gift that keeps on giving. Oh, and speaking of France, here's a link to the gayest homophobes you're ever likely to see. Unless it's some kind of situationist prank. Well, you can't entirely rule it out, can you?